The Jeopardy-like game with 25 questions and the Who Wants to Be a Millionaire-like game with 15 questions reinforce the underlying elements of the 5S Philosophy. Please Note: Product ships USPS Priority Mail flat rate envelope when purchased alone. This is the same 5-S Game Set included with the LeanMan 5-S Simulation Product. Now you have the opportunity to purchase the games separately if you are already practicing 5-S and are looking for a clever way to refresh and support the 5th S - Sustain. The Jeopardy-like game with 25 questions and the Who Wants to Be a Millionaire-like game with 15 questions challenges the skills while reinforcing the underlying elements of the 5-S Philosophy. This "easy to digest" format is designed as a memory trainer for the terms and definitions of 5-S. The goal is for participants to come away with a clear distinction between the principles and the terms used when discussing the 5-S methods. Participants are given a slide show presentation of the terms and definitions with key words underlined which are used later to answer the game questions. Facilitators familiar 5-S can use the slideshow to discuss the key philosophies of the System. Facilitators unfamiliar with 5-S will still find it easy to follow along with the slideshow using the materials given. 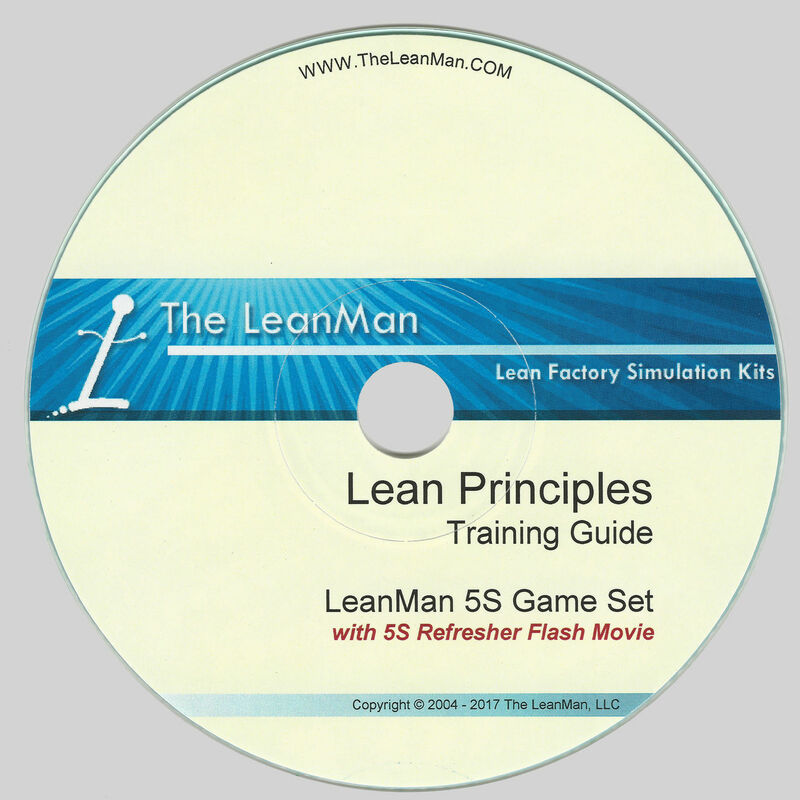 The games use the training information provided in the LeanMan 5-S Simulation Training Kit PowerPoint presentation to create the "5-S Jeopardy" and "Who Wants to Learn Lean - 5-S" fun filled games. The games are certain to put the team members through their paces as they test their knowledge about the 5-S philosophies. The games are created in Power Point which runs as a slideshow with sound. Allow at least 2 hours for this event. It is suggested that the winner of the game be provided with a small prize (donuts, lunch, lunch with the boss, gift card, etc). It raises the emotion level and therefore the learning retention level of the event. Number of participants is limited only by the presentation room size. The Jeopardy game is played first as a group exercise to learn the key concepts, or as a refresher to previous training. There are 25 questions. The facilitator may choose to go around the room asking each successive participant to pick a category and value, or they may choose randomly, or pick on pairs of people to work out the answer. The facilitator runs the “game board” by pointing to the category and value square and clicking it with the mouse. The interactive PowerPoint program branches to the correct screen slide based on how you answer the questions. The Who Wants to Learn Lean game is provided in three versions, each presenting the questions in unique sequence so that the contestants can’t memorize the patterns. A contestant is picked (or volunteers) to take the chair. The facilitator runs the game by clicking on the screen choices for each question. The contestant has the options of picking 50:50, Ask a Friend, or Ask the Team in an attempt to choose wisely. The game is complete with theme sounds and animation. The three versions of the game can be played until someone reaches the top and wins a million dollars (or maybe a free lunch). Remember to run the PowerPoint game in full animation mode and connect a pair of speakers for the sound.